A LINE OF FAMOUS ADMIRALS, including Nelson, Hyde Parker, Kempenfelt, and Sir John Jervis (afterwards Lord St. Vincent), hoisted their flag in HMS Victory. 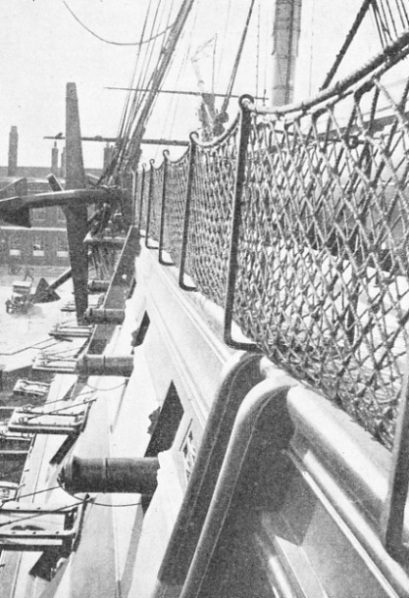 The photograph shows the Victory before she was removed to dry dock in 1922; at various times before that date she had been in danger. Shortly after the end of the Napoleonic wars she was saved from the scrappers’ yard. Then Princess Victoria’s (afterwards Queen Victoria) personal interest in the Victory made the public realize that the ship was a national heritage. In 1908, after having been rammed by an obsolete warship, the Victory was saved from the shipbreakers by King Edward VII. MOST of the world’s navies have contrived to retain some historic ship as an object of veneration and of inspiration to the younger generation. Of all these ships there is none to compare with Nelson’s flagship, Victory, which, restored with infinite care to her Trafalgar condition, now attracts thousands of British and foreign visitors to her berth in dock at Portsmouth Yard. Her pre-eminent position is recognized abroad as well as in England, and she is the most interesting ship in existence - she can no longer be described as being afloat. The Victory inherited a name of magnificent tradition in the annals of the Royal Navy. The name was given to a royal ship in Tudor times, when England, by the spirit and gallantry of her seamen, was beginning to consolidate her sea-power. But the Tudor sovereigns knew well how to rouse the enthusiasm of their people. The naming of ships was only one of the means that they employed to raise the spirit of the mariner who, in successive ships, made good the boast. The previous Victory, herself the finest ship of her day, had been lost with all hands. A disaster of this kind has generally debarred a name from being repeated. Happily, however, the authorities decided to override superstition and, when it was decided in 1759 to build a first-rate of the finest type, the name was selected for her. The Victory was not only to be powerfully armed - that was laid down in the “establishment” which controlled naval design - but also the designer was to be given a freer hand than usual in the matter of dimensions. It was intended that the Victory should be capable of showing the flag in every sea, and she was therefore given an unusually large stowage for drinking water. This provision would permit her to keep the sea for at least four months on end. Moreover, she was given an unusual freeboard, to enable her to fight her lowest tier of guns in any weather. The Victory was so big that, in the same way as several other unusually large ships, she was not built on an ordinary inclined slipway, but in dry dock at Chatham, directly under the eye of the Admiral Superintendent. This dock was roofed over for the purpose and the ship was laid down there in July, 1759. THE QUARTER DECK OF HMS VICTORY as seen from the Master’s cabin. In a modern warship the Navigating Officer holds a position similar to that of a Master in Nelson’s day. 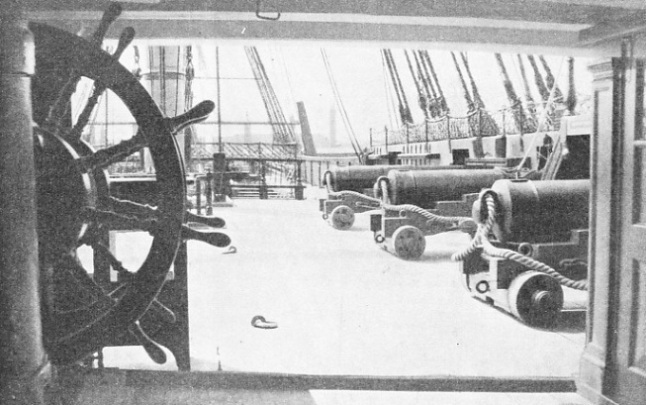 The guns on the right of this picture are three long 12-pounders. Forward of the wheel (seen left foreground) is the place where Lord Nelson was fatally shot by a sniper from the mizen top of the French ship Redoutable at the Battle of Trafalgar on October 21, 1805. A line-of-battleship, 152¼ feet long on the keel, with a beam of 52 feet and 21 ft 6-in depth of hold, giving her a tonnage of 2,162 by the old measurement, had to be built of immense strength to withstand the strain of her press of canvas, and the weight and shock of her 104 guns. Three hundred thousand cubic feet of timber had, therefore, to be used in her construction. The task of obtaining that amount of oak of the finest quality was formidable. It was not until six years after the Victory had been laid down that she was ready for the christening ceremony and for the admission of the water from the Medway into the dock. Her lines were generally admired and the figure-head, built up of elm, was pronounced worthy even of such a ship. When she was new the Victory carried thirty 42-pounder guns on the lower deck, twenty-eight long 24-pounders on the middle deck and thirty 12-pounders on the upper deck; on the quarter deck she had twelve long 6-pounders. This armament was constantly being changed, partly according to the whim of the officer who was in command of her, partly through the supplies of guns available and partly through the improvement in naval ordnance. At one time she had thirty 32-pounders, twenty-eight 24-pounders, forty-two 12-pounders, and ten small carronades; on other occasions heavy carronades - guns of large calibre and immense smashing power but short range - were substituted for some of her long guns. In 1803 she was given two 68-pounder carronades, the biggest in the service, in exchange for two 12-pounders on the forecastle. When the Victory was completed in the early summer of 1778, it was obvious that war with France was inevitable. She was sent round from Chatham to Portsmouth to hoist the flag of Admiral the Hon. Augustus Keppel, Commander-in-Chief of the Channel Fleet, who soon had her in action. In the same July she was in the indecisive battle off Brest which had such unhappy results; in the following spring Sir Charles Hardy became her admiral. She was an unusually good sailer for a first-rate, a type which was generally very leewardly. When she had her bottom coppered at about that time she was the most favoured flagship, and senior officers vied with each other for the opportunity of flying their flags in her. The succession of admirals was a little bewildering, for many of them retained the command for only a few months; but it included some of the finest names on the Navy List - Hyde Parker, Kempenfelt, Howe, Hood and the Sir John Jervis who was to become Lord St. Vincent. The Victory underwent large repairs in 1789, but, apart from that, she was kept busy in the almost incessant fighting with France. In 1781, under Kempenfelt, she was in the partial engagement with De Guichen’s French fleet which succeeded in cutting off his convoy. But the Admiral soon afterwards transferred his flag to the Royal George and went down in her at Spithead, the Victory being close by at the time. Under Howe in 1782 she led the fleet which raised the siege of Gibraltar, and in the following year she was paid off. The outbreak of the Revolutionary War in 1793 saw the Victory in the Mediterranean. She was first under Sir Hyde Parker and then under Lord Hood, taking part in the occupation of Toulon in collaboration with the French Royalists and in the subsequent abandon-ment of that port - a gesture which first brought the shadow of Napoleon Bonaparte over the map of Europe. After many other minor actions, including Hotham’s fight off Cape Roux, she was chosen by Sir John Jervis as his flagship in 1795. THE FIGUREHEAD on the bow of HMS Victory. This famous ship has undergone many repairs and changes, but her original dimensions were: 152¼ feet long on the keel, a beam of 52 feet, a depth of hold of 21 ft 6-in, and a tonnage (by the old measurement) of 2,162. Approximately 300,000 cubic feet of timber were used in her construction. As flagship at the Battle of Cape St. Vincent her name became a household word all over England. Before the end of the year, however, she was relegated to the undignified job of prison hospital ship in the Medway, within sight of the dockyard at which she had been built. After a spell of this work, when she was undoubtedly showing the results of her hard service, she was again put into dockyard bands to undergo a refit that might be described as a reconstruction. The original stern, covered with open galleries, was replaced by a much simpler flush stern with glass windows. At the same time the elaborate figurehead with which she had been built was replaced with an unpretentious crowned shield containing the Royal Arms and supported by cupids. This work prevented her from taking part in some of the hard-fought actions in which she would have been most useful. Moreover it did not include what was really necessary. She still carried the old beak bow, traditional among the big ships since Tudor days and borrowed from the Mediterranean galleys. 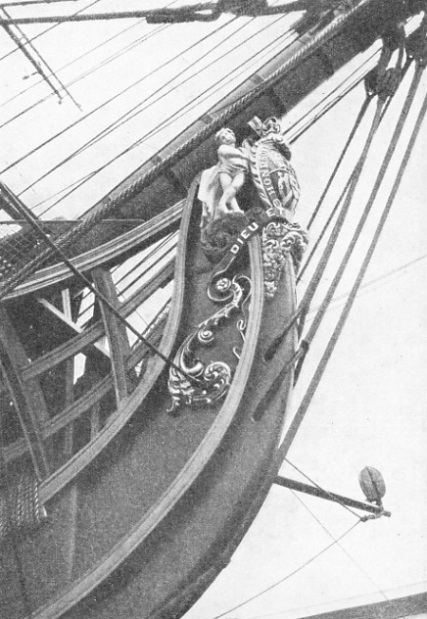 The upper part of this bow ended in a flat bulkhead of no great thickness for keeping out shot, the curved stem and figurehead being built outside it. At that time, many of the King’s ships, especially frigates, had the bow built up in ordinary fashion right up to the forecastle head, which was a much better defence against enemy fire. The omission was to prove expensive at Trafalgar. When she was ready for sea again in 1803, in condition as good as new without having lost her remarkable sailing qualities, the Victory was chosen by Nelson to be his flagship on his appointment to be Commander-in-Chief of the Mediterranean Station. Holding duty to be more important than dignity, he did not wait for her to be finished before he sailed, but made his way out to the station in the frigate Amphion, taking over the Victory when she arrived at the end of July, 1803. After that she was for a long time on the tedious blockade of Toulon which tried Nelson's patience and put the ships to a severe test. It was a close blockade that would be impossible with modern ships and weapons. Week in and week out the ships patrolled just outside the range of the French fortifications, through practically all weathers, the only relief to the monotony being a gale of wind or the necessity of seeking provisions. It was a time when Britain was threatened with invasion, and no risk could be taken of the French fleet slipping away to support the invasion, although Nelson would have liked nothing better than to have had it come out to a pitched battle. While Nelson had the greater part of his fleet refitting as well as it could in an open anchorage between Sardinia and Corsica he heard that the Toulon fleet had slipped out and had disappeared. Concluding that Admiral Villeneuve would make for the Eastern Mediterranean, Nelson took his ships to Alexandria and back, only to find that the French had been forced to return to Toulon by stress of weather. By that time his own ships were feeling the strain and he had to draw them off again for urgent repairs. Villeneuve took the opportunity to slip out again, making his way to the West Indies to collect every available French ship for the invasion campaign. Nelson followed him, leading the fleet in the Victory, but he was misled by false information from the Army, and the French fleet escaped contact. Nelson made his way back to Europe, the British fleet going to Spithead to refresh. When news was received that Villeneuve was in Cadiz with a fine Franco-Spanish fleet Nelson immediately rejoined the Victory at Portsmouth, where he was received with enthusiasm. The allied fleet duly came out and attempted to get through the Straits of Gibraltar to Toulon, with the combined fleet of Nelson and Collingwood after it. THE PORT HAMMOCK NETTINGS, in which the seamen stowed their hammocks. This kept their quarters clear and protected the men from shot and flying splinters. The Battle of Trafalgar which followed on October 21, 1805, is too well known to demand a description in this chapter; but, as might have been expected, the Victory took her full part in it. She flew Nelson’s flag at the head of one line, while Collingwood led the other. The famous signal “England expects that every man will do his duty” was made as the two fleets closed, immediately followed by his favourite “Engage the enemy more closely” long before she had arrived within range. Captain Blackwood attempted to persuade Nelson to go to his ship the Euryalus, out of the line of battle, and to conduct the action from a position in which he could see the two parts of the force and at the same time be comparatively safe. But Nelson would not agree and, in a light wind, continued to lead the fleet slowly forward in the Victory. For a long time she was under the fire of the French broadsides before she could bring a gun to bear, and she suffered severely. There was a poor breeze, and the Victory’s already slow speed was slackened by her mizen topmast being brought down by French gunfire. When she was finally alongside the enemy ships she gave just as much as she received. The sixty-eight-pounder carronades which had been put on her forecastle two years before fully justified themselves. At the beginning of the action the one on the port side, loaded with a round shot and a barrel containing 500 musket balls, raked the French flagship Bucentaure, and the long guns on the broadside, double-shotted, did devastating damage. After that the Victory was engaged in close action throughout the battle. In addition to having the Admiral mortally wounded on her quarter-deck, she suffered great material damage and was crippled aloft, so that when a gale sprang up after the action she was nearly lost. Only fine seamanship enabled her to be towed into Gibraltar. To many people the Battle of Trafalgar marked the end of the Victory’s active service career, but she was to do a good deal of work after that. Given some sort of a jury rig at Gibraltar, she was sent home, and in January, 1806, was paid off. In those days this meant the discharge of the whole ship’s company, which Nelson had brought to such perfection. Thoroughly refitted, the Victory was ready for active service again in the spring of 1808, and for the next five years she was fully occupied. She was prominent when Sir John Moore’s army was withdrawn from Corunna. 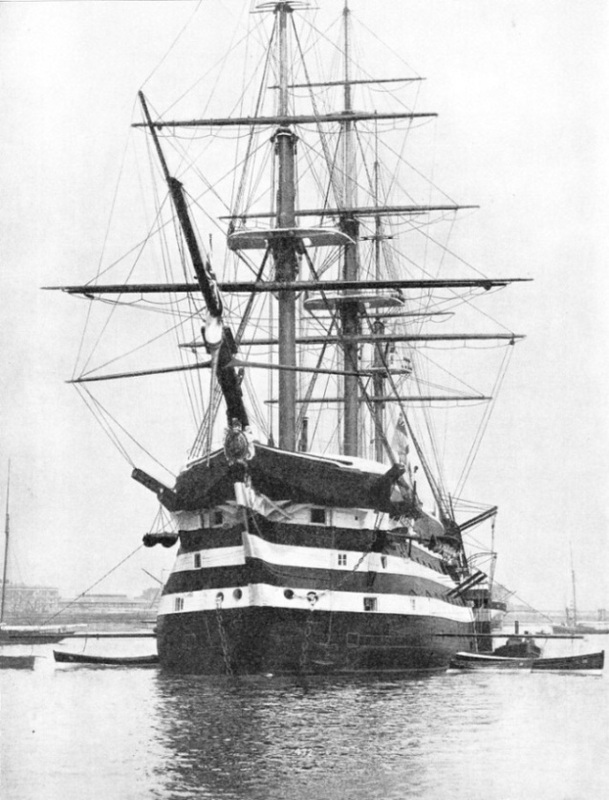 Later she became the flagship of Admiral Sir James Saumarez, Nelson’s old companion. Under him she did much work in the Baltic, including the blockade of Cronstadt. In 1814 she underwent a further thorough refit, even more of a reconstruction than before. The following year she was again available as a flagship, when six Admirals claimed the honour of flying their flag in her. The end of the Napoleonic wars ended this dispute. Soon afterwards it was suggested that she was past service and should be sold to scrappers on Thames-side. Luckily, the newspapers took the matter up with indignation and she was reprieved, to become flagship of the Commander-in-Chief at Portsmouth. Few people took the trouble to go to see her, and it was not until Princess Victoria (later Queen Victoria), then a young girl of fourteen, persuaded her mother, the Duchess of Kent, into taking her to see all over Nelson’s ship - she had just read a book about him - that the public awoke to the fact that a most interesting ship was to be seen. Visiting the Victory became a fashionable amusement, and it has continued so, with greater or less enthusiasm, at intervals ever since. The Victory’s reconstruction at the end of the French Wars, and her gradual cutting down aloft so as not to put too much strain on the old hull, had left her a mere parody of the ship in which Kempenfelt, Jervis and Nelson had been proud to serve, but the general public took little notice of that. In 1908, the obsolete battleship Neptune while being towed away to the scrappers’ yard, rammed her and damaged her severely, and there was again talk of letting her go for firewood; on that occasion it was the intervention of King Edward VII which saved her. In spite of her reconstruction and the care which was latterly given to her, she was suffering the effects of her great age, and in 1922 the public was shocked to learn that her fabric was in a bad state and that she was in danger of falling to pieces. A “Save the Victory Fund” was started and, largely because of the generosity of Sir James Caird, a patriotic shipowner, the necessary sum was raised to reconstruct her completely. The opportunity was taken to restore her appearance to that of her proudest days. She was put in an iron cradle and, encased in cement, is now carefully preserved in a dry dock in Portsmouth Dockyard. A VIEW TAKEN FROM THE BOWSPRIT HEAD showing the full width of the forecastle and the two 68-pounder carronades on either side. The armament of HMS Victory was considerably changed, but when she was new she carried thirty 42-pounder guns on the lower deck, twenty-eight long 24-pounders on the middle deck, and thirty 12-pounders on the upper deck. On the quarter deck she had twelve long 6-pounders. It was in 1803 that the two 68-pounder carronades shown above were given her in exchange for two 12-pounders on the forecastle. The two carronades were the biggest in the service. 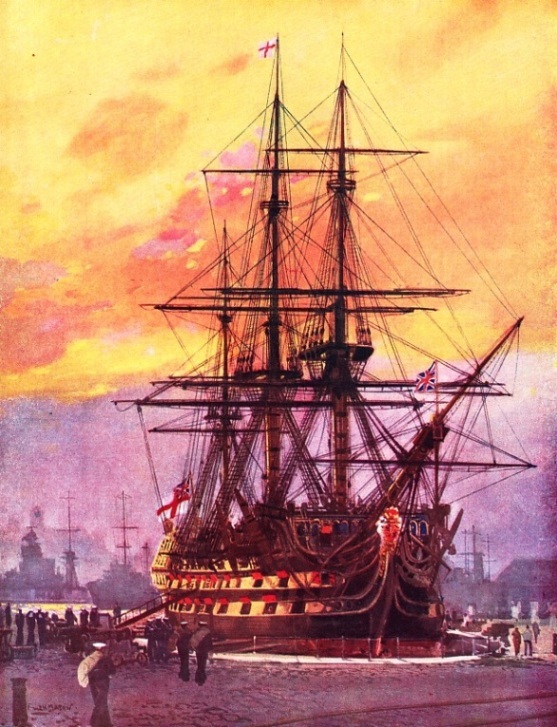 An impression of HMS Victory by Frank H Mason. In 1922 the fabric of this famous ship was in danger of falling to pieces. An appeal was started and, largely because of the generosity of Sir James Caird, the well-known shipowner, enough money was raised to enable the Victory to be reconstructed and restored to the condition of her Trafalgar days. She was put in an iron cradle and, encased in cement, carefully preserved in dry dock at Portsmouth Dockyard.